CREATIVE FULFILLMENT IS AN ESSENTIAL NECESSITY OF LIFE. 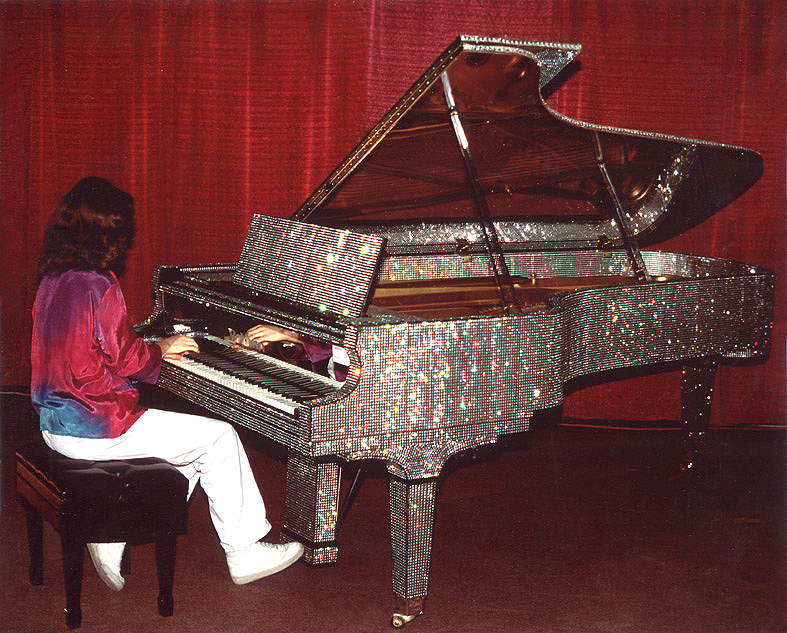 Deborah Judith playing Liberace's rhinestone-encrusted Baldwin SD10 Concert Grand. Unfold the essence of the musical experience with an innovative teacher, performer and composer. 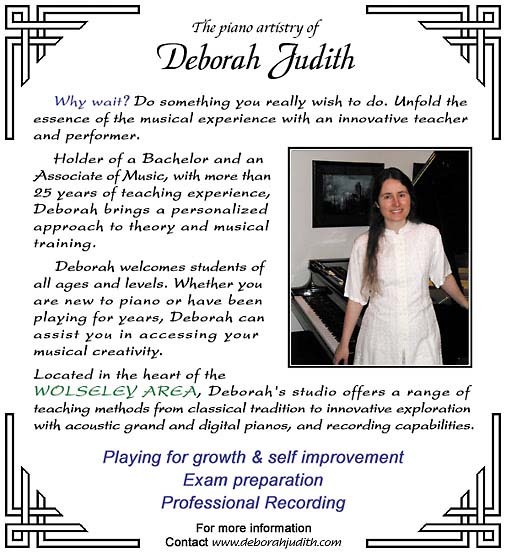 Deborah Judith is the holder of a Bachelor and Associate of Music, with over 30 years of teaching experience. A long-standing member of MRMTA (Manitoba Registered Music Teachers Association) and teacher for the Preparatory Studies Music Department of the University of Manitoba, she is fully qualified in all aspects of exam preparation, and brings a personalized approach to theory and musical training. Deborah welcomes students of all ages and levels. They have ranged in age from 4 year olds to retired senior citizens. Whether you are new to piano or have been playing for years, Deborah can assist you in accessing your musical creativity. Her teaching skills and presence have been acknowledged by students and their families as contributing to an increased enrichment in the quality of life . With Deborah, learning music really is fun! 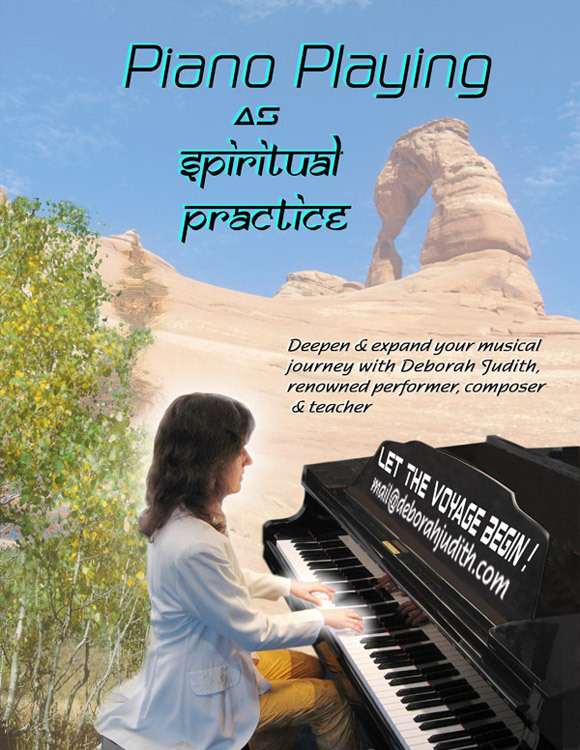 Located in the heart of the historic Wolseley district of Winnipeg, Deborah Judith's attractive and comfortable studio offers a range of teaching methods from classical tradition to innovative exploration with top of the line Kawai acoustic grand piano and Korg Triton Studio 88 digital keyboard. As an added feature, students can professionally record performances, repertoire and original compositions on state-of-the-art Digital Audio recording and production equipment, at special student discount rates. All of these factors help to make the music experience a fertile source for balanced inner growth and self-development. Helping to nurture and develop this creative fulfilment is something Deborah Judith does exceptionally well. with students is dedicated to deepening their connection to the source of real music within themselves. As such, it promises to be one of the most exciting, innovative and creative years ever. WEEKLY CONCERTS FEATURING HER SPONTANEOUSLY CREATED MUSIC. TAKE THIS OPPORTUNITY TO HEAR THE SUBLIMITY OF TRANSCENDENTAL MUSIC! renowned performer, composer and teacher. New & Exciting Musical Developments! One of Canada's great pioneers of modern music will appear in live performance at PLATFORM Gallery, 100 Arthur Street, Winnipeg, on Saturday, April 29th, at 7:30 p.m. The remarkable pianist. LUBOMYR MELNYK has been acclaimed on both sides of the Atlantic as one of one of "the most innovative and creative pianists of the 20th century." He belongs to a rare group of composers who stretched the concepts of piano music in the last 30 years, developing an amazing piano technique that has both enthralled audiences and terrified other pianists with its unprecedented technical difficulties! This genre of music is called CONTINUOUS MUSIC ... and is based on a blending of Eastern and Western musical concepts, involving complex note-pattern and stunning melodic arpeggios! The result is both beautiful and meditative..... and captivating. His double album "LUND-St.PETRI" sold out within weeks of release in New York! ... and several of his recordings have been hailed as a "must" in every music collection! He has been referred to by various musicians as "the Franz Liszt of modern piano!" Melnyk is best known for his creation of special music for 2 and 3 pianos, and at this performance at PLATFORM Gallery, he will be playing both solo and multi-piano works, featuring the new YAMAHA multi-recordable el-grand where the pianist/composer can combine several lines of piano music, even pre-recorded, into the virtual live performance! It promises to be an acoustic delight .... that will stretch your mind in many and wonderful directions! Everyone is most welcome to attend this performance. Lubomyr Melnyk-s concert is sponsored by The Canadian Music Centre, Prairie Region within its New Music For New Places series. This is as rare opportunity to hear one of Canada's musical pioneers .... so don't miss it! This sounded intriguing so I decided to check it out. A part of me got very curious and wondered if this person might be a potential teacher. My last piano guide was Marek Jablonski at the University of Manitoba, at the time when I was preparing for a Bachelor's Degree in Piano Performance. The concert was compelling. The notes poured endlessly from Lubomyr's fingers and his playing seemed inexhaustible. He spoke of the piano as being a real friend, even a sanctuary. No fear. This is a belief that I deeply share and which I continue to work toward. After the concert I spoke with Lubomyr, and then played some of my own improvisations on the piano as he mingled with the concert goers. After the crowd had gone, he asked me to stay, and a small group of us went out for tea. The next couple of hours unfolded into a most interesting conversation, and I felt increasingly drawn to this "continuous music" that he played. At the end of the evening, we offered him our studio facilities if he should ever wish to perform here on another occasion. Equipped with a book of 22 Continuous Music (CM) etudes for the "beginner" (as an introduction), I began to attempt playing the outer form of this music, the notes. Over the next few months I made some discernible headway with a few of the studies but it felt like slow going. I emailed Lubomyr with questions about the music and he was gracious and prompt in his replies. To my great happiness my own improvisatory work made a quantum leap forward during this time period as well! I played 2 complete concerts of spontaneously improvised music (see posters on Chronicles page) in the spring/summer of 2006. Both concerts were very successful; I enjoyed them and the response from those who attended was very positive. Along with the music, we set up a large screen projection system which beamed colourful images that changed in a response to the musical sounds that were being produced  a very beautiful and hypnotic complement to the music. Over time, it didn't feel like the CM was progressing fast enough and part of me wished to be able to work directly with Lubomyr. Part of this wish was motivated by questions about the accuracy of my approach. In the summer of 2006, Lubomyr wrote in an email about his interest in returning to conduct a series of workshops. I sent information to various musical groups but nobody was able to accomodate these sessions. My husband and I decided to host the events at our in-house piano/recording studio. These workshops and other events lasted from December 1st to December 10th. They were very stimulating and fun for me and all of the participants. Mr. Melnyk is very focussed and dedicated to helping students make as much progress as possible. Each workshop session was a marathon for our fingers, and everybody left with a sense of the excitement of the real possibilities for dramatically improving their technique. I attended every session and worked diligently with the exercises, wishing to refine them as much as possible under Lubomyr's guidance. On the final day of the workshops, Lubomyr gave a complete concert of Continuous Music to a most appreciative audience. The listeners were transported into dimensions far removed from the daily life. Many of us commented afterwards that the piano didn't sound like a piano anymore. My own experience was that many of the sounds became bell-like  the word "gamelan" came into my mind. The next day I had a 1 hour private lesson with Lubomyr to review some of the exercises, but mainly to look at the 22 Etudes. There I discovered that I had made good progress with the etudes and got a much more clear idea of how to proceed with them. It gives me great happiness to practise them now. They make so much more sense and I am exploring many of the pieces instead of just a few as in the previous 6 months. As well, the inner space of the music is opening up, so the practise moves into a meditative flow which is pleasant to sustain. I have done less improvisatory work in the last few months due to this focus on Continuous Music. It feels like something new is coming in that area, but at the present time it is difficult to know what. At my Christmas student recital I performed part of a CM etude which shifted into an improvisation. Everything flowed smoothly and with great beauty. As for goals and aspirations, I wish to evolve to a point of teaching Lubomyr's technical practices to other students. There is also the possibility of a Continuous Music Performance with Lubomyr in a year's time. But this is all in the realm of possibility. What is real at this point is the practice, so that is what I focus on. total disorientation then a NEW mental perception arises. You describe it as a "sensation". So far to me it seems more like a level of awareness or consciousness." When playing Continuous Music (CM) I experience the rh/lh patterns becoming independent entities in their playing; they flow each with their own particular rhythm & 'special' notes. My mind is either completely overwhelmed and just hanging on for the ride as the hands fly over the keys OR there is a simple observation of each part in its independent nature and a deeper appreciation of the effect of the two threads weaving together. Sometimes the soundwaves feel 3 dimensional. Now I feel such a deepening acknowledgement of the technical advancement of Lubomyr's playing. The mental focus needed to "allow" this music to manifest is not of this world. One must train one's mind to be able to encompass this music. Take heart, the process is gentle & enjoyable. 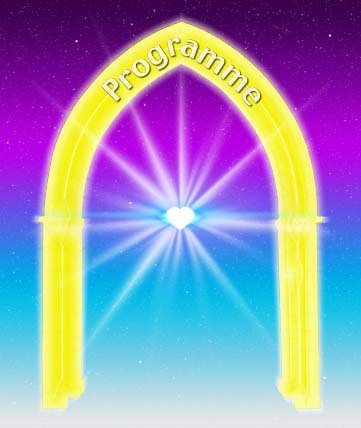 It seems to be a complete surprise and delight when the portals of deeper advancement into the art spontaneously open and happily beckon one inside. It feels like how to play (not just piano!) again.